Although it is of course, possible to enjoy a trip without the services of a guide, but – particularly in some of the more exotic and unfamiliar parts of the world – if you do you may miss out, in more ways than one. There is usually no shortage of candidates to chose from, but wherever possible – and it is seldom not – picking a local one is the ideal way to get the most out of your holiday while putting a little back into the place you are visiting. A good local tour guide can be an invaluable asset to the whole holiday experience, if only for pointing out things which otherwise you either might never have seen, or which are not general knowledge. Despite the best efforts of travel writers, not everything makes it into the guidebooks and often the most fascinating insights into a country are those which are somewhat hidden – and it always feels better to be “in” on the secret. Aside of knowing their way around and being a mine of useful information about their home, local guides can be worth their weight in gold when it comes to where to shop, how much to pay and how to be sure that what you buy really is as locally-produced as you would wish it to be. Additionally, although they are not interpreters as such, the services of English-speaking local guides can certainly make experiencing the real country much easier to do and there is always someone to turn to, if and when you do get yourself hopelessly confused! As an eco-tourist, buying local services is every bit as important as buying local goods. Not only does it resist the creeping hand of globalisation – especially in fragile and remoter parts of the world – but also quite literally supports precisely those things which you have come to see. Traditional ways of life are not immune to change – or loss – nor, clearly, are they quaint anachronisms kept alive for the tourist industry; when local people can no longer make a living where they are, inevitably they move away and their communities die. Many countries are experiencing massive youth migration to the cities, leaving the rural areas with an increasingly ageing population and – as has happened in Thailand – the social structure suffers severely. In some areas community based tourist ventures have sprung up to counter the failing viability of traditional occupations and many of these have been successful in driving a genuinely local tourist industry, with the people themselves providing the services necessary to make it work. Local guides in these circumstances form one of the critical lynch-pins of the enterprise but even where the tourism is more conventional, engaging a guide who actually lives in the place itself still ensures that the local economy benefits from your tourist money. It is often possible to hire a guide directly, but unless you are really sure what you are doing, it is probably neither the easiest, nor most sensible way to go about it. 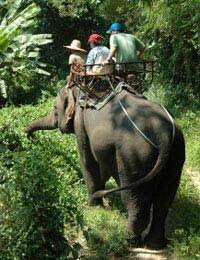 Fortunately most good eco-travel companies are well aware of the advantages of the local guide and can make the appropriate arrangements for you. If, however, you want to keep your holiday arrangements flexible, it is worth checking whether there are agencies where you are staying which can provide a guide for you on a more casual basis – often at the cost of only a few pounds a day. Your travel agent or tour operator should be able to advise you about this, as well as about any official system of recognition or guide training that applies where you are going. If there is such a thing in place, always use approved guides. For one thing, they have bothered to train – often at some cost to themselves – and for another, it does establish that you are spending your time in the company of a trustworthy individual, which has to be an important consideration. The right guide can make a good holiday a great one and the experience can be a two-way street, offering you a way to get to know the country better and your guide, an insight into a new breed of tourist – the eco-traveller. Now that really is a cultural exchange!